The artwork representing the IDIBELL's visual identity was created by the Catalan artist Antoni Tàpies. This work responds to the passion that drives the scientific team of the institution, while meant to represent the quality, talent and human dimension of the research activity to society. Heart and health cross were born from the touch of the master, it's the work from which arises a universal symbol to represent the IDIBELL. 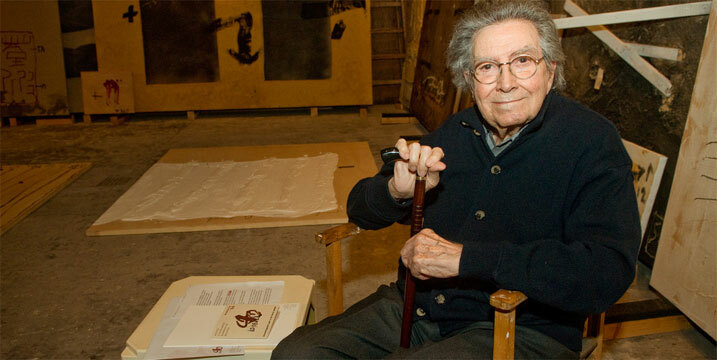 Antoni Tàpies was born in Barcelona in 1923. Painter and sculptor, he is one of the leading exponents in the world of the informalism artistic movement, and he is considered one of the most famous Catalan artists of the twentieth century. Barcelona artist's work enjoys a center of study and conservation in the Fundació Antoni Tàpies in Barcelona. Tàpies has created a unique style of avant-garde art in the twentieth century, which combines tradition and innovation in an abstract style but full of symbolism, which gives a great importance to the material substrate of the work. The artist died at 88 years old in Barcelona on February 6th.